The Word-Inspired Template uses the TelerikMetro theme. 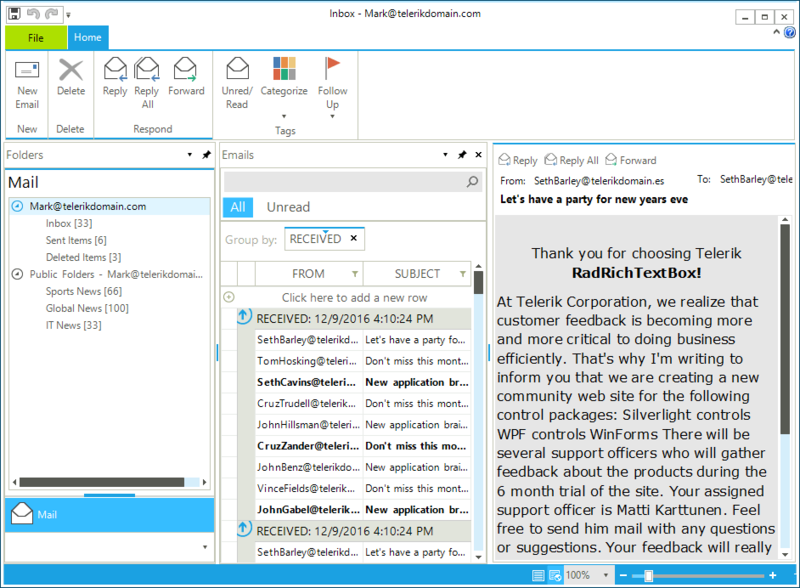 The outlook inspired templates make use of the TelerikMetroBlue theme. In this article you will find more information on how to create a project from one of the available templates as well as more details regarding what controls each template contains. When creating new project, select the needed template as seen on Figure 1. 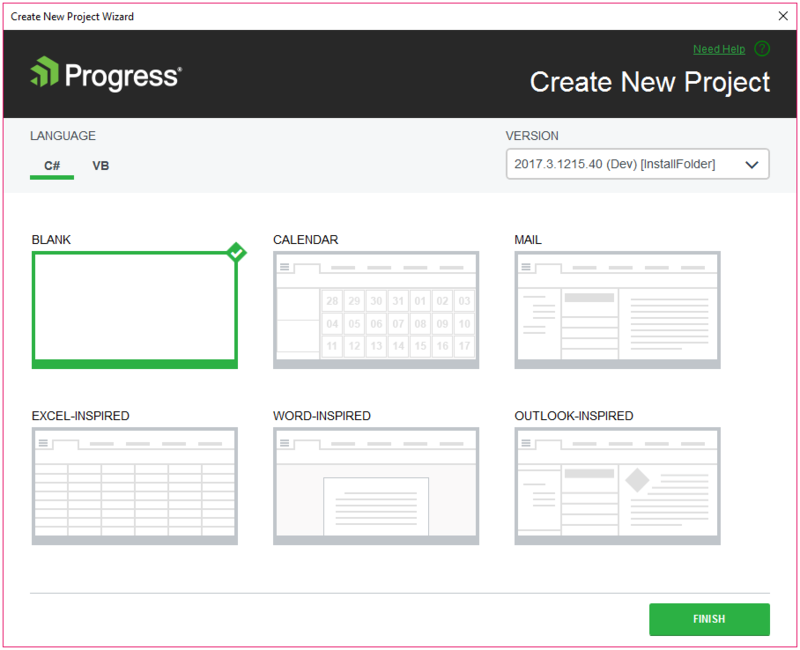 The Word-Inspired Template implements Word-like editing experience represented with the Telerik UI for WinForms controls. 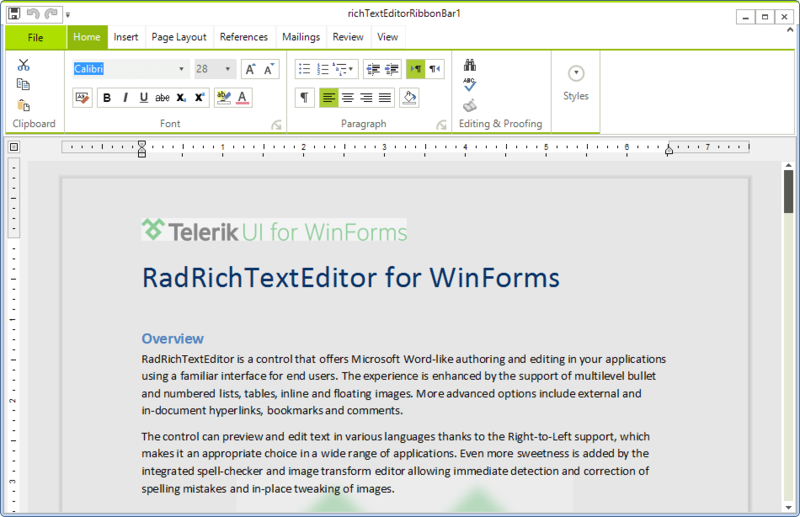 It provides a complex integration of controls like RichTextEditorRibbonBar, RadRichTextEditor in an already set up example. It also demonstrates the broad range of editing and formatting capabilities as well as built in specific features of these controls. In fact the Word-Inspired Template is almost identical to the RadRichTextEditor's First Look example in our demo application. In this template we joined the powers of some of the most prominent controls in Telerik UI for WinForms to create one of the most recognizable applications in the world – Microsoft Outlook. You can easily spot RadGridView, RadRichTextEditor, RadScheduler, RadDock and RadCalendar how blend seamlessly. The Visual Studio template can be used for a quick start of any other business application. The Outlook-Inspired Template is built from two separate templates available in Visual Studio – Outlook-Inspired Mail Template and Outlook-Inspired Calendar Template. They are separated so you can use only the needed functionality in the cases in which you need only the email interface or the calendar one. You can see how the different parts of the template look like on Figure 3 and Figure 4. The Outlook-Inspired Mail Template can be used separately and it has been integrated as the mail part of the Outlook-Inspired Template. You can see it on Figure 3. 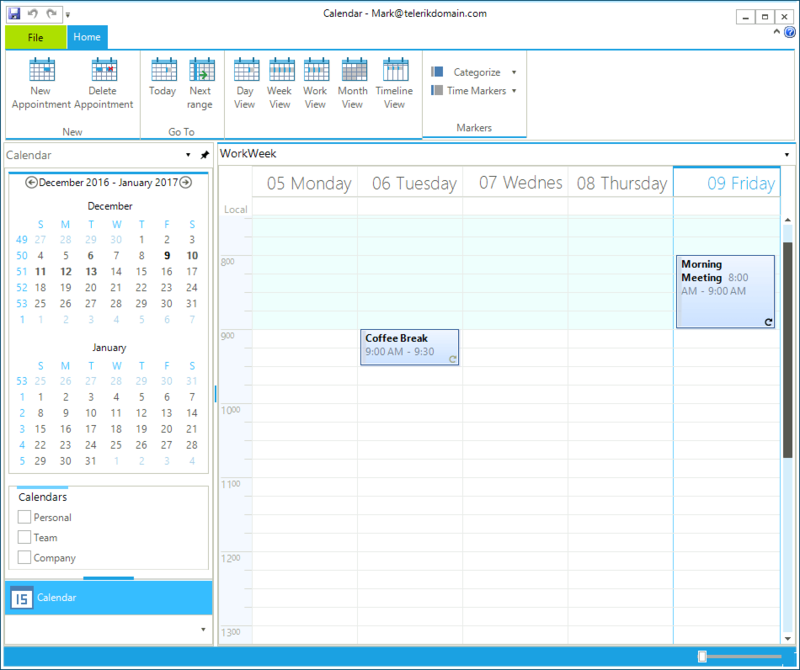 The Outlook-Inspired Calendar Template can be used separately and it has been integrated as the calendar part of the Outlook-Inspired Template. You can see how the template looks like on Figure 4. The Excel-Inspired Template implements Excel-like editing experience represented with the Telerik UI for WinForms controls. 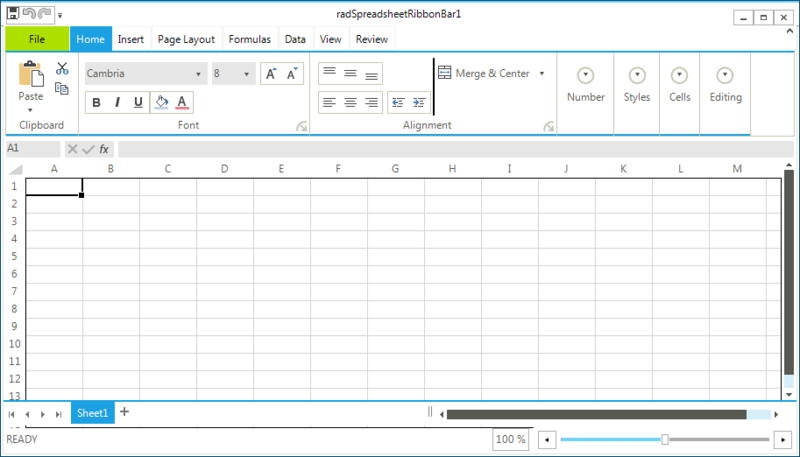 It provides a complex integration of controls like RadSpreadsheetRibbonBar and RadSpreadsheet in an already set up example.You can see how the template looks like on Figure 5.